When your back is against the wall, fighters often come out in a fight strong as ever in order to right the ship so-to-speak. With the competitive level in MMA constantly increasing it become very easy to find yourself staring at consecutive defeats on the verge of falling into a label of a sub-.500 fighter. And while you may be much more talented then a record reads, in the fight game it is often more about your last fight then your career work. Next Friday night inside the Santa Ana Star Center, Bellator 105 may very well contain a moment of necessary resurgence for one New Mexico based fighter and he will draw an opponent who arguably is in the very same scenario. Often affiliated to the Jackson-Winklejohn fight team and Coach of the Westside Power MMA gym, Rocky “The Angry Aztec” Ramirez (4-4-1) will look to get back on the winning track in a 185-pound Middleweight bout. 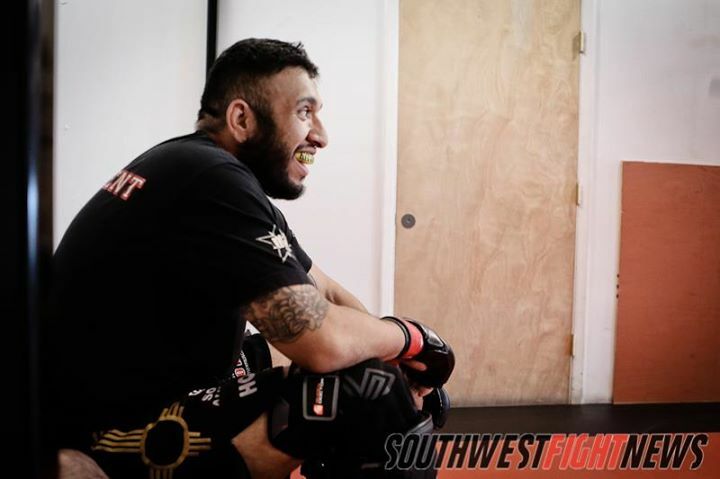 Well-known in the regional scene, Ramirez is a Jackson’s MMA Series vet as well as a competitor from the “old-school” New Mexico promotions, Desert Extreme and the Duke City MMA Series. Ramirez will give up experience to opponent Eddie Larrea but his heavy handed striking should more than make up for it. Arguably best equipped by his powerful striking, Ramirez has finished three of four opponents with his strikes and has even dabbed his hands into the professional boxing scene. The seemingly go-to strikes for Ramirez are lead hooks which he lands very hard and the rest of his strikes are very technical in their delivery. His most significant strength may come in his ability to finish a fight when he has an opponent hurt; Ramirez punishes stunned opponents with high volume and smothering power. That strength may be best shown in his bout with Matt Madrid two years ago when he took Madrid deep into fight and forced a verbal submission after punishing strikes in the third round. If their is a way to counter the dangerous striking of Ramirez it has been by using a dominant grappling game to take away his boxing prowess. While Rocky has won three times via some method of knockout, he has lost that same amount of times via submission. When an opponent has been able to ground the striking attack they have put themselves into a advantageous position. It will be very keen of Ramirez to bring a more versatile ground game into action when he meets up with a seasoned MMA veteran. Wisconsin’s Eddie “Fast” Larrea has 41-fights under his belt and the record includes a 100% finishing rate with eight career submissions. Larrea has fought an average of six times per year since 2008 and his busy schedule has seen him fight mostly in his regional circuit. Larrea will make the trip down to New Mexico and for a trip that long, fight fans should fully expect Larrea to be hungry to get a much needed win. He will come in as the smaller fighter usually competing at 170-pounds and Ramirez is a very good size 185-pounder. That size may play a huge part in the clinching and grappling departments and it also may give Rocky an even more sizeable power advantage in the striking range. Larrea hasn’t lost by strikes in his last 16-outings which implies Ramirez will have a tall task ahead if he plans for a stand-up battle on October 25th. That mentality works both ways however as statistically Ramirez has bounced back from losses with bad intentions. Ramirez is undefeated (3-0) when bouncing back after consecutive losses and if that stat holds true, Larrea is in for a bad night in Rio Rancho. The powerful hands of Ramirez will be advantageous for the Albuquerque trained fighter and if Larrea has an advantage it is definitely in the submission game. A good implementation of gameplan may be the deciding factor in this Middleweight bout. Stay tuned to SWFight for more event coverage, bout breakdowns and analysis. Join us in sending our support and best wishes to Rocky and the Westside Power MMA team and make sure you come out to the Bellator MMA fights on Friday night to cheer on the local, hard-working fighters step into the cage for some top flight MMA action. For more updates, including fight night results and news follow me on Twitter @KingStark24 and the Southwest Fight News handle @SWFight.